The winery started off as a vineyard in 1983 and was 13.5 acres of Chardonnay, Gamay Noir, and Vidal varietals. 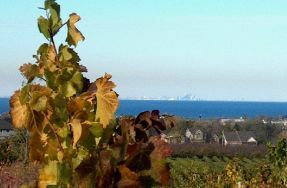 Located along the Beamsville Bench, Mountain Road Wine Company’s vineyards have been producing some of the best grapes in the Niagara Peninsula that many of the local wineries enjoy. This vineyard was one of the first to implement a new approach to the region. This included reduced nutrients, shoot thinning, extending the trellis height, leaf plucking for more sun exposure, dropping most of the crop in August and netting the grapes for protection from the birds. The first wine produced was in 2000 and was a Gold Medalist in the Best Sweet White Wine at the Cellars of the World International Competition in Ottawa. The winery uses only half the grapes grown and sells the remainder to other wineries in the region. Most of the wines are VQA, but all use 100% Ontario grown grapes. Complimentary Tastings are available while the wine shop is open. Taste all wines including icewines and reserve wines.